This recipe is all about the technique. It might be the easiest pork tenderloin recipe ever. Just season the pork and pop it in the oven. It is fool proof! I found this over at Sabbespot via Pinterest. Gotta love Pinterest! I used my homemade cajun seasoning on the pork tenderloin, but you can use any seasoning you wish or even the Italian BBQ Marinade that I posted last week. The possibilities are endless! Rub tenderloin with olive oil. Sprinkle seasoning over pork. Place pork in a 9x13-in dish. Put pork in for 15 minutes. Turn off oven. Do not open the door. Let the pork sit in oven 45-60 minutes longer, until meat thermometer reads 145 degrees. Does this ever look tender! Very nice! QUICK QUESTION...I dont cook alot of pork so I was wondering if I doubled this how do I adjust the time? Wasnt sure if you double the time or not. It sounds delish!! Lori - I don't think you would need to adjust the time if you are using 2 tenderloins. Only if you are using a thicker cut of meat like a pork loin. Oh, you know that looks good! I tried this yesterday evening, it turned out beautifully. I had a liquid marinade, so simply soaked the tenderloin in the liquid marinade for the brief time it took for the oven to reach 500. I then drained it, rubbed it with olive oil and added salt and pepper, and proceeded with the remainder of the recipe. It cooked perfectly, although after the 1 hour resting in the oven, the internal temp was 170 -- way over the the recommended, but that was okay with me. It remained very flavorful and juicy. I have been on a tenderloin kick lately! Like you said, they are so flexible and you can use just about any seasonings. I made this the other night and it was fantastic. I used a Lawreys Sundried Tomato and Garlic spice pack I had and it was super tasty. Thanks so much for the recipe!! IMPORTANT warning ... don't be tempted to extend the oven cooking time just because your loin might be a bit larger. I made that mistake and mine was a bit dry. Since you can now cook pork a little pink it would have been perfect had I not messed with the great directions. I tried this recipe last night, and it came out very tasty. But my only comment is that 45-60 minutes of rest time in the oven is way too long if you want the tenderloin a nice pink in the middle. I checked the meat at 38 minutes and it was already 180 in the thickest part, so I removed it. Next time, I will probably cook at 475 and then check at 30 minutes. It was still very moist but overdone for my tastes. I'm so excited to get my oven fixed so I can try this! Thanks for your recipe. 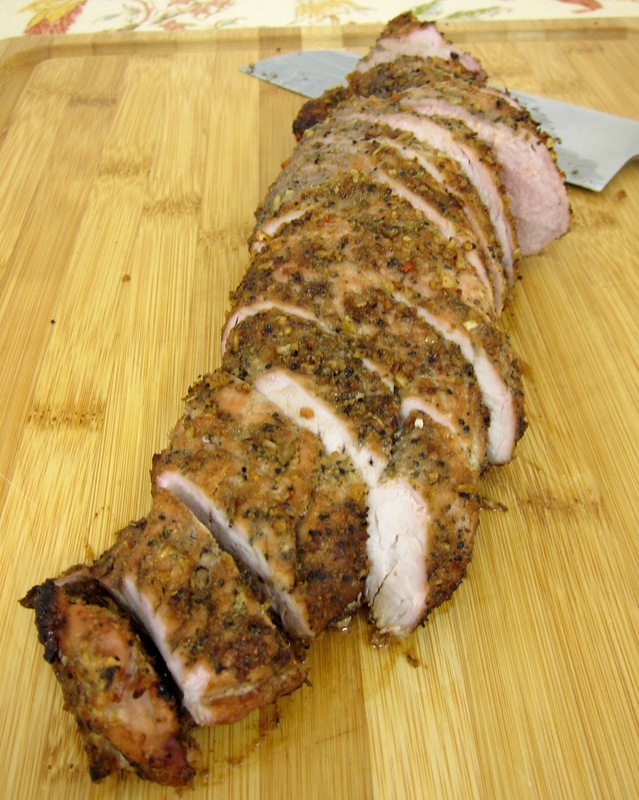 My best friend said this is the best roasted pork tenderloin she found in the internet! Wonderful recipe - thank you! I do agree with Ed - I had a smallish tenderloin and checked it after 22 minutes with the oven off and it was 180 degrees. Turned out fabulous! Do I cover this dish? I'm planning a dinner party and will be cooking 3 tenderloins - probably a little over a pound each. Would that affect the oven time? Should I put them on a baking sheet so there is more room? Shouldn't affect the time. I would use two pans - you don't want to crowd the tenderloins. This looks so delicious! My oven is broken, but I do have a small counter-top oven, only problem is that the highest temp I can cook at is 450...I was wondering if you have any suggestions as to whether I could cook it successfully at 450, and how would I adjust the cooking/resting times? Thanks in advance! We like our pork with some pink inside. Loved the method. We took ours out of the oven after the initial 15 minutes and let it rest for 10 and it was perfect! I've made a lot of your recipes, but this one is one the BEST! BTW- I let it go 55 minutes in the oven after the initial 15 minutes of cook time & it was perfect. Still very juicy. We just finished eating it.The Tony Chachere's Creole seasoning gives it a nice little kick. I posted pics on my page. Can't wait to make it again, thanks! I didn't use any water, but you can add some if you feel it needs it. Thank you! Also, is it ok I'm using a tin instead of glass? That should be fine. Good luck!